#CX. Ultra-Low Volume Catalyst Cell. The #CX provides a high temperature cell for catalyst studies where very low gas volume is required and where the flow of gases across the sample must be well defined within the optical beam. 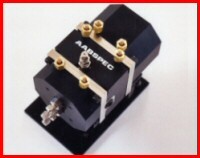 Unique Aabspec technology is used to achieve the overall design. The region of the sample first contacted by the gas flow is in the optical beam, so the interaction can be observed in real-time. The internal gas volume of the cell is very low. The #CX provides transmission spectroscopy for 13mm diameter samples, up to 0.5mm thickness at temperatures to 600degC. External surfaces are water cooled. Related products include the #2000-A.